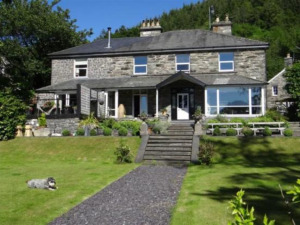 Tyn y Fron B&B Guest AccommodationTyn-Y-Fron is an attractive stone property standing in its own grounds of nearly an acre, within the beautiful Snowdonia National Park on the edge of the village of Betws-y-Coed. You can enjoy a delicious breakfast from our interesting and varied menu (locally sourced) looking out over the terraced gardens with spectacular views across the Conwy Valley and into the village. With our vast local knowledge we will help you plan your days out. We enjoy a peaceful setting and yet are only a seven minute walk from the village centre. All bedrooms are individually designed for your comfort, whether for a romantic week-end away or an activity break. We include the little extras that make a big difference. You can choose to wake up to a valley or mountain view. For those who need to keep in touch, there is free Wi-Fi throughout the building. Breakfast, cold buffet and freshly cooked hot choices, locally sourced wherever possible. Special diets can be catered for (with advance notice). * Clock /Radio Ipod docking station. Valley View Suite £115 per room per night, 2 sharing. Just as the name says the views from this magnificent extra large room are wonderful. The giant picture window allows the light to fill the room where you can sit and relax in the leather recliners and just drink in the views. The Super King Bed with the most comfortable of mattresses allows for the best night’s sleep and you have the option for us to serve you breakfast in the room so you can take your time in the morning and we will do the rest. A fully tiled en suite shower room completes the modern and contemporary suite. A very large and spacious room with a leather Super King sleigh bed. This is a relaxing and sophisticated room with stunning views over the valley and mountains of Snowdonia where you can sit and enjoy the leather massage chairs and watch the sun set. There is a large ensuite bathroom with a bath (and electric shower over) so you can soak away the aches of the day and take in the view at the same time. A beautiful large room, bright and airy with a feel of real comfort. As well as a super-king bed, there is a large shower room en-suite. Quiet and peaceful. The comfy leather chairs look out over the tranquil secret courtyard garden with the very busy bird feeding station. Bedroom 2 £85 per room per night 2 sharing. Deduct £10 for single occupancy. A pretty, warm & cosy double room full of character, decorated in relaxing dove grey and off white, with en-suite shower. The stunning views up Garmon mountain and the garden are so peaceful and a haven for the birds: a really delightful room. Bedroom 3 with 4 poster bed £95 per room per night. Deduct £10 for single occupancy. This is a most charming and romantic room with a double 4 poster bed. With comfy leather chairs you can sit and admire the breathtaking views of the valley and mountains of Snowdonia. This room has a fully tiled En-suite shower room. Four people can be accommodated in a double and twin room plus a travel cot for infants. The cottage has recently been refurbished and offers all home comforts. Pets (two) can be accommodated in the cottage. Tyn-Y-Fron is an attractive stone property standing in its own grounds of nearly an acre, within the beautiful Snowdonia National Park on the edge of the village of Betws-y-Coed. You can enjoy a delicious breakfast from our interesting and varied menu (locally sourced) looking out over the terraced gardens with spectacular views across the Conwy Valley and into the village. With our vast local knowledge we will help you plan your days out. We enjoy a peaceful setting and yet are only a seven minute walk from the village centre. Breathtaking views from property and a lovely garden for the enjoyment of guests Children welcome from age 11. From the south A5 take A470 to Conwy, after half a mile you will see several B&B signs on the right. Turn up Lon Muriau lane and follow the signs to our car park.